Charlotte, N.C. – Global anilox roll supplier Harper Corporation of America is committed to providing exceptional products and services to its customers. The company is excited to officially announce the addition of the QD™ Printer to its flatbed equipment offerings. The QD Printer accommodates all QD proofer handles and print heads. 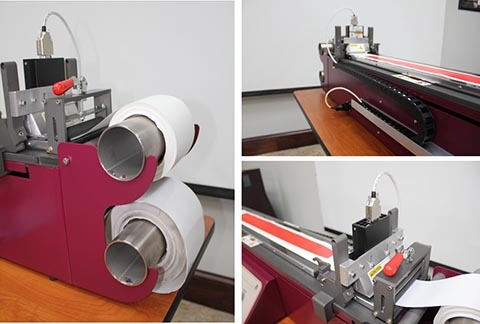 These components have been developed for most roll-to-roll printing processes including: flexo, direct gravure, and offset gravure, as well as flexo using printing plates, ITR (in-the-round) flexo and gravure images, and all laser engraved images. The QD family is, by far, the most versatile ink proofing and project testing equipment available. The QD Printer was designed for the ink environment with lab safety in mind. Built using modular construction with heavy duty components, it is extremely durable. The QD Printer, like all Harper proofers, uses laser engraved ceramic anilox and imaged gravure rollers. The custom controller has numerous adjustable features and a digital display. The travel speed units can be set in inches, feet, centimeters, or meters per minute. Travel speed can be set from 5 to 150 ft/min, or the equivalent speed in other units. The stroke can also be adjusted from 12 to 33 inches (30.5 to 84 cm). This allows for easy multi-pass testing. The controller has a cycle mode adjustable from 1 to 10 round trips. In addition, three drying options – hot air, Adphos NIR, or LED UV Phoseon (395nm) – can be activated simultaneously with printing or additional drying cycles. In terms of size, the QD Printer has a table footprint of 42 in. (107 cm) by 14 in. (35.5 cm) and an overall length (including paper) of 48 in. (122 cm). In addition, it comes in two models to fit either Standard (2.75 in./70 mm) or Plus (5 in./127 mm) printer widths. It has a universal electrical power supply of 85-265 VAC, 65W, and 50/60 Hz. The QD Printer was developed for the functional and printed electronics development sector. However, due to its adjustability, it is a great addition to any ink or product development facility. Harper Corporation of America has never stopped developing accessories for the QD family, and the QD Printer is the latest addition.